LOUISVILLE, Colo. -- It was back in 2006 when downtown Louisiville was marked as "blighted" and became part of Louisville's urban renewal program. If you drive down Main Street today you wouldn't believe it. The area has come alive over the years with tons of restaurants and retail shops. "In 2011 and 2012 we started to be found," said Louisville economic director Aaron DeJong. There are no signs of it slowing down either. 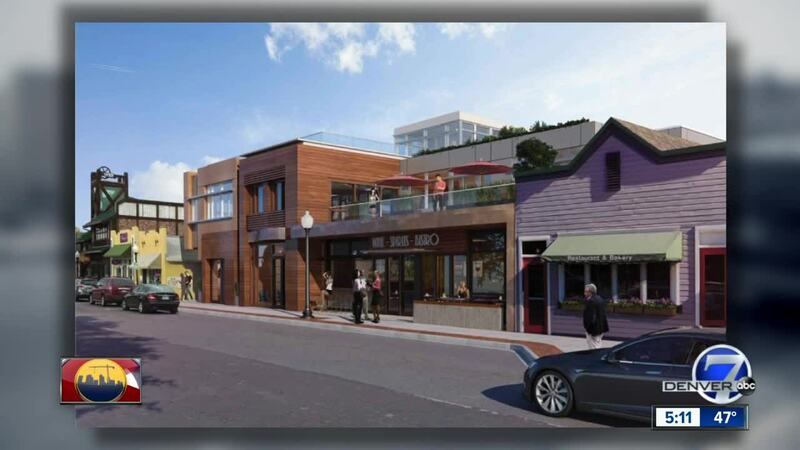 City council recently approved a project called 'Terraces on Main' that would replace two old brick buildings across the street from City Hall. The two-story development will be comprised of 22,000 square feet of office and retail space. "When I was a kid you didn't really come to this area," said business owner Caleb Dickinson. "It's unbelievable how much stuff has come in." Dickinson understands that growth comes with challenges too. "Growth is tough. It’s not for everybody," he said. "The more people that live here the more expensive it gets. The longer you have to wait at a restaurant. It's harder to park. People want to live here because Colorado is amazing." Soon-to-be-retired Barbara Butterworth's bookstore sits right next to the new planned development. She welcomes the growth. "It's going to happen so you may as well try to manage it in a good way," she said. Downtown Louisville has a rich history, too. DeJong says plans have always been in place to preserve the area's historic buildings as inevitable growth continues.